This is Part 1 of 2 Parts about the Point In Time Count (PITC) in San Diego and what took place in Ocean Beach at 4:00am this morning. The region Tim coordinates includes Mission Bay, Old Town, Sports Arena, Ocean Beach, and Point Loma. As Tim, both well prepared and skillfully organized, handed out maps to the counting teams, I was able to speak with a couple of volunteers. Nancy Matloff, a first time volunteer, connected with PITC through Health Care for Homeless Veterans. She believed about 30% of this mornings volunteers work at the VA and the rest are involved in social services in one way or another. Once the warmly dressed crowd of 30+ set out, I inquired with Tim as to where these early risers were from. Counting Teams were asked to indicate on their map grid whether the homeless they observed were individuals, in vehicles, or in a makeshift structure. PITC has met weekly since October, 2010, to pull this together so well. Tom Ziegert, Pastor at Point Loma Methodist Church connected with PITC through the Forums on Homelessness held in OB last year. He contributed what he could by welcoming the PITC volunteers into the church to use as their meeting point. Sandy Borum, Peer Outreach Specialist, VVSD was also there. She provided information on resources currently available to Veterans. She introduced Courage To Call, a toll free 24/7 helpline that provides free, confidential info, guidance, and referrals to Veterans, Military, Reservists, National Guards, and their families. This helpline is answered by post 9/11 vets. It also serves women vets with children and families. All it takes is the … Courage To Call (877) 698-7838. By 5am three volunteers returned with their count finished. 5:30am two more arrived back at the church. As each team returned from their count, they spoke with Tim about their observations and handed in their map grids which now contained an actual count of the homeless. One team invited one of the local homeless to join them on their count. “He’s been around OB for quite some time and was familiar with the other homeless in OB.” one team volunteer offered. By 6am, the coffee I downed at 3:30am was beginning to wear off and I could see Tim was about to have his hands full with the returning crowd. Thanking everyone involved, I headed home to write this up and go back to sleep. Part 2 tomorrow ~ PITC surveys homeless at Second Chance breakfast. The team of three that I was on this morning consisted of a new friend for me and a friend I’ve known for some time who happens to be homeless. I believe that you may be referring to our team in your article. So, thank you very much for covering the Point In Time Count so well and so quickly. thank you, christine, for showing up in the wee hours to offer your wisdom, time, and footwork to this ongoing effort. oh yes, christine, it was your team that accepted the assistance of one of our local homeless. would it be alright to mention his name? just wanting to give credit to those that took part. I believe it was brilliant on your team’s part for including him and kind and generous on his end for offering his knowledge. A very accurate count is assured when we all work together. working together, everyone offering what they can, is how we will see real change occur. Sunshine-Thanks for allowing the people involved ‘write’ this post. After all why would anybody get up that early for another human being. The gentle reader should also notice that both the VETERANS Administration (VA) and the VETERANS Village of San Diego (VVSD) are very much involved in this project. With local 1392 of the VETERANS of Foreign Wars (VFW) itself facing homelessness I appreciate your efforts in highlighting the positive role that these individuals and organizations are bringing to our community. I’m surprised I retained as much as I did at that hour. Everyone who was up and at ’em this morning was glad to be there, offering their time and efforts to end homelessness in this simple way. It was inspiring to see so many individuals coming together in this endeavor. I know that PITC is one vital aspect of a much larger undertaking, yet its the individuals showing up and offering what they can that makes it happen. Thanks for your kind words. 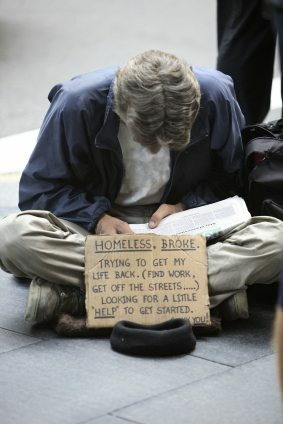 This homeless person is a friend of mine and I can ask my friend if it would be OK to reveal his/her name. It just made sense to me to ask my friend if he/she would be so kind as to volunteer for the Point In Time Count. I agree that it was very gracious and generous for him/her to participate! I do believe that working in a team of three was very helpful – for which we can thank our Regional Volunteer Coordinator, Tim Sandiford. Thank you to the wonderful OB volunteers – and special thanks to Tim Sandiford for his selfless dedication to the project and passion to help his community! This was our best, most comprehensive, count yet.